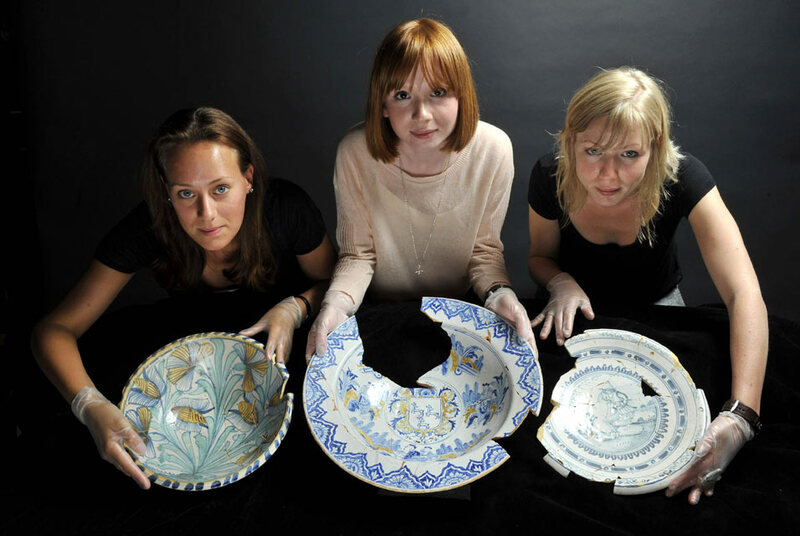 Three elaborately decorated 17th c. Delftware bowls have been found by archaeologists excavating a period garbage pit on the south bank of Thames. The Southwark area of London was a party neighborhood in the 17th century, with bars, brothels and spectacles galore. The bowls would not have been as valuable then as they are now, but to find them thrown away in the red light district is still a surprising turn. The pieces are a charger platter from the 1660s painted with tulips, a bowl painted with a boy taunting a dog, and a bowl dated 1674 which commemorates the marriage of Mr. Nathaniel Townsend of the Leathersellers Company. They’re tin-glazed, a ceramic known today as Delftware even when made in Britain rather than in the famous Dutch ceramics center of Delft. Roy Stephenson, Head of Archaeological Collections at the Museum of London, said the richly decorated bowls should be seen as rare pieces of fine art in their own right today. “The thing about tin-glazed wear is every piece is unique because it is painted individually by hand,” he told Reuters. “The analogy I use about 17th century Delftware is: if you were to try and acquire 17th century art today you would have to be a multi millionaire,” said Stephenson, adding that it was the most unusual group find he had seen in the last 20 years. There are no signatures or artists’ marks, but the ceramics would have been seen as pieces of art for display on tables and mantelpieces, not as food vessels or utilitarian items. The bowls were found in fragments during preparation for an upcoming rail extension. Archaeologists pieced them back together. There are still a few bits missing, but there’s more than enough left to make a handsome display in the “War, Plague and Fire” gallery of the Museum of London.